A recent survey by Money Magazine ranked Tampa, FL as the best place to live in the Southeast United States! The study, took in to consideration numerous factors including job markets; affordable housing; accessibility to health care; culture; open space; crime rates; and school systems. The Tampa market has been a long standing part of the Trillium brand of companies, with two physical locations operating full time as well as many remote offices providing talent to the area. The increased demand for talent with an aging workforce, competitive wages, and abundance of recreational activities makes the area an excellent choice for candidates open to relocating for a new career. Driver Appreciation Week Wraps Up! Last week was a whirlwind of events for the Drivers at Trillium! Our branches nationwide went all out to recognize their hard working staff! Click the link below to view a slideshow of some of the events, featuring our staff! The Driver Appreciation Week festivities are in full swing here at Trillium! Our branches have rallied to do some awesome things for their staff this week, stayed tuned for more on that tomorrow! Today, we’re excited to congratulate Deishurnae from our Atlanta office on winning the $250 VISA gift card drawing! Our team in Atlanta was elated to learn that Deishurnae’s name was drawn, congrats again Deishurnae! Professional Drivers- Keeping America Moving! While many of us enjoy the luxuries of day to day life without much thought, millions of professional Drivers know exactly the amount of effort and miles that went in to your favorite products arriving in your local stores or your doorstep. For many people who do not know anyone who drives professionally, the extent of thoughts that go in to the logistics industry often stop just beyond traffic jams. Here are a few amazing facts from the American Trucking Associations that just might blow your mind. Nearly 70% of all the freight tonnage moved in the U.S. is moved on trucks. Trucks move 9.2 billion tons of freight annually in the U.S.
3 million truck drivers are needed to move the 9.2 billion tons of freight. The trucking industry requires 37 billion gallons of diesel fuel annually. What an amazing service these Drivers perform for us each and every day! Take a moment to thank a Driver for all they do! Trillium Kicks Off Driver Appreciation Week 2015! We’re all about celebrating great things here at Trillium, Driver Appreciation Week is one of those times! This week we will be celebrating the thousands of Drivers who set out on the road every day ensuring that your goods arrive safely and on time. Those Drivers who have been with us for a year or more can look forward to a week of gifts, gift cards, and more! We’re delighted to recognize these hard working employees and all they bring to our country! Stay tuned for photos, interviews, and much more! Trillium Makes the Staffing Agency Power 500 List! 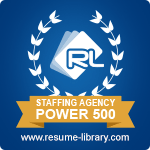 Trillium Staffing was recently ranked in the top 200 on Resume-Library’s Staffing Agency Power 500 list! “With almost 90 offices nationwide, hundreds of internal staff, and tens of thousands of field staff; quick and easy communication is very important to us. Social media provides us with a great platform for announcements, advice, and staying in touch with our candidates and clients. We look to increase our social media engagement continuously.” stated Jenna Mathieu, Marketing Manager. This list is a leaderboard for staffing agencies who are active on Twitter & other social media as scored by Klout. The scores from Klout are influenced by a variety of metrics taken from Twitter, Facebook, Google+, LinkedIn, Instagram, Foursquare, Wikipedia and Klout itself. Have you connect with us on social media? Join us today! René Poch founder and CEO of Trillium Staffing, recently announced that Trillium was ranked in the Top 100 Fastest Growing U.S. Staffing Firms! Trillium Staffing was founded in Battle Creek, Michigan in 1984, by founder and CEO René Poch. Since that time, René Poch has steadily expanded the employment service to include seven companies with over eighty locations across the nation. Today, Trillium is proud to be recognized as a national leader in recruitment and staffing, providing service to thousands of clients and employees in various capacities across the country. Trillium was recently recognized as the 57th Largest Staffing Firm in the United States and ranked in the Top 25 Largest Industrial Staffing Firms in the U.S. by Staffing Industry Analysts for 2015.